Forum Index > Historical Arms Talk > Kettle helms and bevor time period? Posted: Tue 07 Jun, 2016 8:16 pm Post subject: Kettle helms and bevor time period? Just started researching kettle helms as something to add to my collection. Are there any example of kettle helms being worn with a bevor or something like it in the 1380-1420 range? The short answer seems to be that they seem to have existed but are quite rare, judging from manuscript evidence, and are only found after 1410 AD. 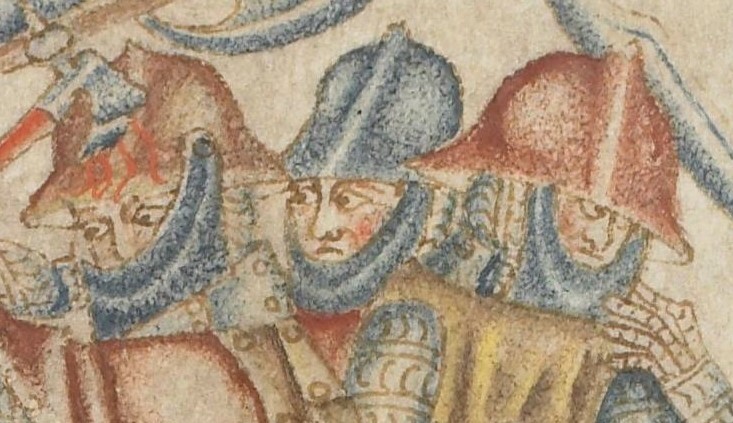 The great majority of manuscripts show kettle hats worn with a mail coif underneath them. Even around 1420 AD, the images that show kettle hats almost always show a mail coif. Out of a total of 156 images showing a kettle hat from 1408-1420 AD, only about 5 or 6 show something that fairly unambiguously is a bevor with a kettle hat. Put in a percentage, that's 3.2% of all images with a kettle hat and bevor, and 96.8% without. If I were you, I would go with what we can see in the clear majority of images: either a kettle hat and mail coif, or (less frequently) a kettle hat with neither a coif nor bevor. If you're going for what looks "period-right", It makes sense to represent what is seen in the overwhelming majority of images, instead of focusing on the unusual minority. Thanks I finally got a chance to start looking through some manuscripts and you seem to be right they are very rare. Matter of fact I was super sleepy and missed your examples. But they do seem to be part of the experimentation that going on in the period with solid throat protection. Probably get an early simple one just as an add on some times. One reason I like the period is the transitional and experimental nature of the time. "Always carry a firearm east of Aldgate, Watson." Thanks Victor that is a an early bevor it seems. 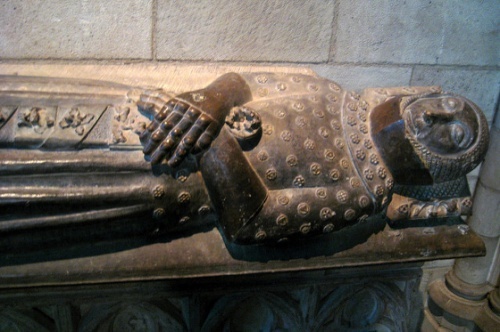 There are similar depictions from 1320-1340. 2 kettle hats with visors. I suspect those might be similar to those found in the Holkham Bible of 1327-1335. Well, I stand corrected. I really had no idea there were such early 14th century examples of bevors. What I do not understand is why the bevor and kettle hat combination did not become much more common in art from 1380 to 1420 AD. One would think soldiers would start wearing them in preference to mail coifs. I suppose one reason could be the additional price of the bevor, although this assumes that soldiers who wear a kettle hat may not have had as much wealth as those who wore other types of helmet. 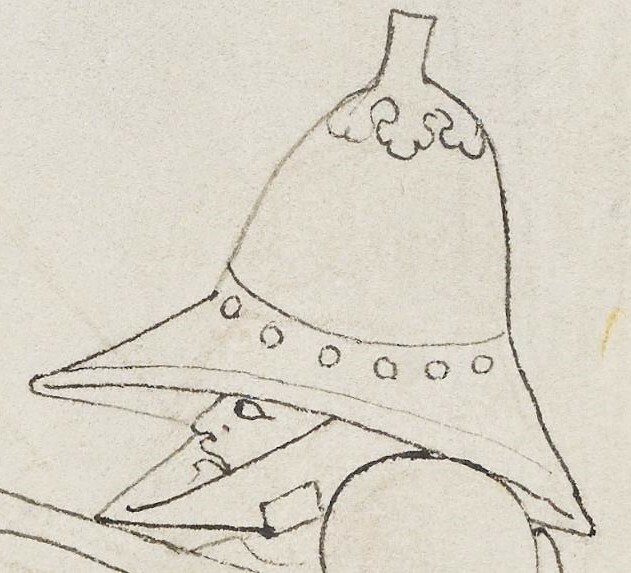 Alternatively, maybe the early bevors, which do not seem to cover as much of the face as later 15th century bevors, were found to not afford much better protection when paired with a kettle hat. 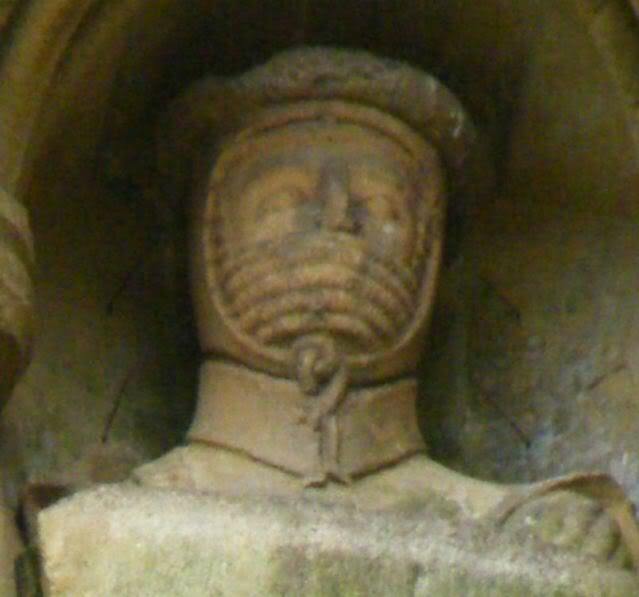 The various 14th century bevors shown here might protect one's throat better than a mail coif, but a lot of the face is still exposed with the kettle hat. So maybe it may not have seemed worth it to make the extra investment. Kettle hats worn with bevors show up in a few Spanish altar paintings from the early 15th century. Here are a couple from a great example of the genre (that also includes many other interesting details). Mark that is a great image and thanks for including the link to the source. Those are not really bevors, of the sort worn with a sallet. They are standing collar gorgets, and very much a Spanish thing, though they do seem to be illustrated (rarely) in other places. Oh, and doesn't it look as though they are wearing mail on their heads (coif?) as well, like Ermengol X? Yes they are a sort of proto bevor as the kettle helms and gorget/bevors were making progress to later becoming true Sallets. So found some interesting things in the Le Livre et le vraye hystoire du bon roy Alixandre. (1400-1425) It has lots of bevors and early type of plate neck protection. It has has lots of kettle helms. And it is also French. I found another early example of a kettle hat and bevor. In this instance, calling the throat protection a gorget seems incorrect, since plate covers much of the face as well. Manuscript Miniatures gives the date of this manuscript as being 1320-1330 AD, although I am not sure precisely how this determination was made. BNF Gallica, who holds the manuscript, more cautiously dates it to 1301-1400 AD. Certainly, given that the far right figure seems to be wearing cuisses, poleyns and greaves, the Manuscript Miniatures date seems a bit early, especially given that other figures in manuscripts circa 1316 AD are shown covered in mail from head to toe. Manuscript Miniatures states the manuscript is from Italy, originally. As a side detail, note the presence of very substantial mushrooms in the background. Manuscript Miniatures gives the date of this manuscript as being 1320-1330 AD, although I am not sure precisely how this determination was made. BNF Gallica, who holds the manuscript, more cautiously dates it to 1301-1400 AD. The date is taken from Mandragore, the BNF's database of manuscript illustrations. The interface and image quality are much better on Gallica, but sometimes you can find things on Mandragore that aren't on Gallica, and very often the dating is much more specific as in this case. Wells Cathedral and has been dated to c.1230-40s.